When I was told I was reviewing a cushion I was a little taken aback but this is a really useful cushion indeed. Coated in a black velvet like material this triangular wedge shape cushion has a small pocket on the front to slip your table into. Be that an iPad or Galaxy Tab or even a Microsoft surface. 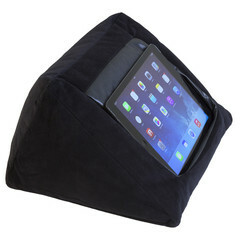 The positioning is perfect for using the device on your lap or say reading in bed. When using the iCushion on your lap you soon realise the real advantage of using a soft padded stand over a conventional tray or table. It moulds to your legs and as you shift weight it moves with you. The iCushion can be purchased in many different colours to match your decor. I had the black one to review which felt right at home with my black Surface tablet. When used with the Surface there wasn't really a good way to attach the Surface keyboard and keep it in the iCushion pocket but that is not what it is designed for. Using it in the iCushion without the keyboard gave the perfect touch experience and was far more stable than using the Surface's kick stand on my lap. I usually start to get shoulder ache when holding a tablet for extended periods this totally alleviated that. Its just great for watching movies as the viewing angle is perfect without the need to hold the tablet at all. My only slight criticism is I found the tablet had a tendancy to fall out if I handed the iCushion to someone else but this is easy to avoid by holding the device in place - just something you have to remember. It is really well put together and feels like it work stand up to every day use. The filling has a bean bag type feel to it which allows it to mould to uneven surfaces but maintain rigidity.